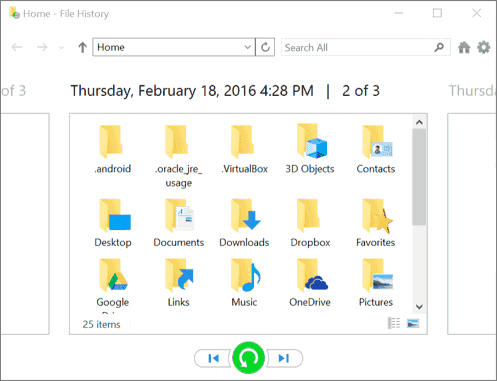 Position : Tips - How to recover deleted files from Recycle Bin in Windows 10/8/7? How to recover deleted files from Recycle Bin in Windows 10/8/7?? In this article we will show you several methods on how to recover deleted files from Recycle Bin in Windows 10/8/7. It often happens that you've emptied your Recycle Bin and then realized that you still need the deleted files. Fortunately, if you act fast and correctly, you can restore deleted files before they get overwritten. Solutions presented in this guide enable you to recover permanently deleted files after Recycle Bin is emptied. Read on below to view solutions or click to jump to the section you are interested in. Is the file really deleted after emptying Recycle Bin? What to do after data loss? 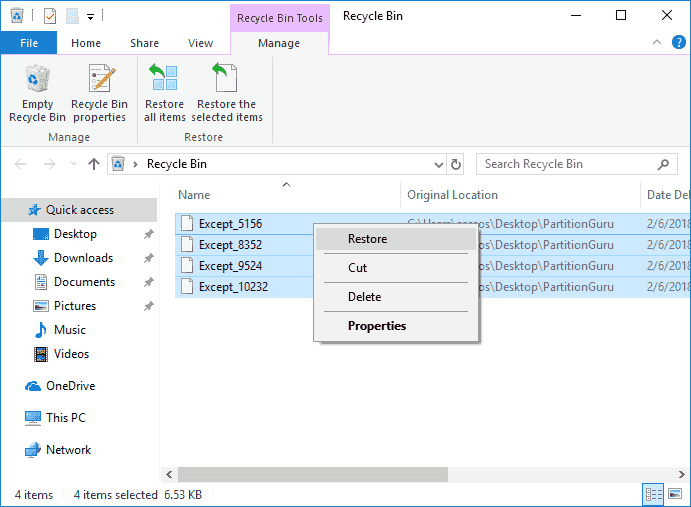 If you know all about Recycle Bin and deleted file recovery, you can skip this section to methods of Recycle Bin recovery. Anyone can delete files at some point and then realize that deleted files are still important. Thus Windows created a Recycle Bin as an extra step in file deleting process, which puts deleted files in Recycle Bin temporally. Users have a second chance to restore files in Recycle Bin to original location easily. In this way, if you delete files from computer hard drive by pressing Delete or dragging files to Recycle Bin, these files will be kept in there, so that you can browse the Recycle Bin and restore them anytime you find them useful. However, not all deleted files can be restored from Recycle Bin, for example files deleted from Recycle Bin or Shift + Delete, as they are kind of permanently deleted for Windows. In this case, files no longer exist in Recycle Bin and they cannot be restored directly. Don't be panic if you are facing such problem, for it is still possible to recover deleted files from empty Recycle Bin. Recovering lost files is not a rare action, and it is done by many users every day. That's because accidental deletion of important data always occurs. You may wonder why users like deleting files all the time. There are quite a few factors that can explain your confusion. First, deleting files is a good way of freeing up disk space. If your computer is running out of disk space, you can get free space by deleting useless files and then store new data. Second, some users want to protect privacy by deleting sensitive data such as password, bills, bank account, etc. The third reason is to improve computer performance. If system partition is packed with waste data, the running speed will be affected. Fourth, delete files by mistake. This is one the major causes of data loss problem. Last but not least, some files are removed by malware or virus without notice. The Recycle Bin is located on Windows desktop, representing a directory where deleted files and folders from local hard drive are stored temporarily. If you delete files from external disk such as SD card, USB flash drive, portable hard disk, files will be deleted directly instead of being put to Recycle Bin. Recycle Bin has an icon which is placed in desktop. When it is empty, the icon is an empty recycle bin, while if it contains one or more files; the icon turns to a recycle bin full of paper. 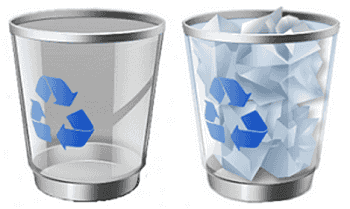 Actually, each partition on hard drive has a Recycle Bin, but all deleted files can be viewed in this one Recycle Bin icon on desktop. How to move items to Recycle Bin? You can either drag files you want to delete to Recycle Bin icon or select files and press Delete key (or right-click files to be deleted and select Delete option from context menu). If you want to bypass the Recycle Bin while deleting data in Windows, you can delete files by pressing Shift + Delete on keyboard. Moreover, you can view and manage content in Recycle Bin easily. Double-click the icon from desktop and you can open it, which enables you to view files and folders you deleted. From the menu bar you can see "Empty the Recycle Bin" and "Restore all items". You can restore all files to their original location, as Windows knows the original location of each file. Also, you can restore specified files by selecting items you need and clicking "Restore this item". Besides, Windows allows users to edit properties of Recycle Bin. If you right-click on the Recycle Bin icon, you can select Properties item from context menu. On the Properties window, you can see drives and partitions which contain a Recycle Bin as well as custom size for each of them. Since Recycle Bin has a Maximum size, if the deleted file is too large, or Recycle Bin does not have enough space to store it, the file will be deleted directly. What happens when Windows deletes a file? Is it possible to recover deleted files after emptying Recycle Bin? When you move a file to Recycle Bin, nothing happens to the file. The only change lies in the pointer record which tells Windows where the file is located before deletion. Now the pointer shows the file is in the Recycle Bin. If the file gets deleted from Recycle Bin or you empty the Recycle Bin, the pointer record will be deleted. In that case, Windows won't be able to know where the file is located physically. The physical location once occupied by the file will be marked as free and available for storing new data. That's to say, deleted data still stays on hard drive before it gets overwritten. As long as operating system does not store data on that physical location, we have chance to recover deleted files using recovery software. In the following section, you can find a couple of solutions to recover deleted files from Recycle Bin, and you can follow these methods to get back deleted files easily and quickly. Step 2 Open the Recycle Bin by double-clicking the icon or right-clicking it to select Open. Step 3 Search in the Recycle Bin for files and folders you want to recover. You can view file in a couple of formats such as Details, List, Small icons, Large icons, etc. Also, if you view file in Detail format, you can sort files by name, original location, deletion data, size, modify data, etc. Thus you can easily locate files you want to restore. Step 4 Select files you want to restore. You can select one or multiple files and folders one time. To select multiple files, you can hold Ctrl or Shift key and select files using mouse. Step 5 Restore deleted files. You can right-click on selected files and click "Restore" from context menu, or click "Restore the selected items" from menu bar. Then selected files will be restored to their original location quickly. File History is handy tool designed to backup files on your computer, but it does not do a complete backup. It backs up versions of files for folders like Documents, Music, Video, etc. on your PC. Also, it is able to backup data to any storage device connected to your PC, such as external hard drive, USB drive. 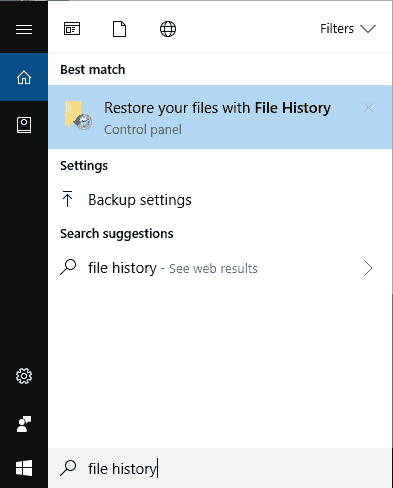 If you do not keep backups, hopefully File History is enabled on your computer, for you can recover deleted files from File History backup when Recycle Bin is emptied or files deleted via Shift+ Delete. You can browse and restore different versions of your files, for instance, you can view through a timeline to select the version you want and restore it. If File History is not available on your computer, you can restore deleted files free with file recovery software. Step 1 Type File History in the searching box and click "Restore your files with File History" from searching result. Step 2 Click Restore files from a current backup at the bottom of the window. Select the right version you need and click Restore button (It has a green and circular arrow). Step 3 Select "Replace the file in destination" option if there is already a file or folder with same name. Also you can choose Skip This File or Compare Info for Both File if there are conflicts. If you've emptied Recycle Bin and do not have a backup, the only way to undelete files is using file recovery software. Such type of software is able to scan free disk space and analyze data remains on disk, so that it can get back deleted files. Nowadays, file recovery software can be freeware or shareware. Freeware is available on the market, but it supports less data loss issues. In this part, we'll show you the deleted file recovery process with free file recovery software. 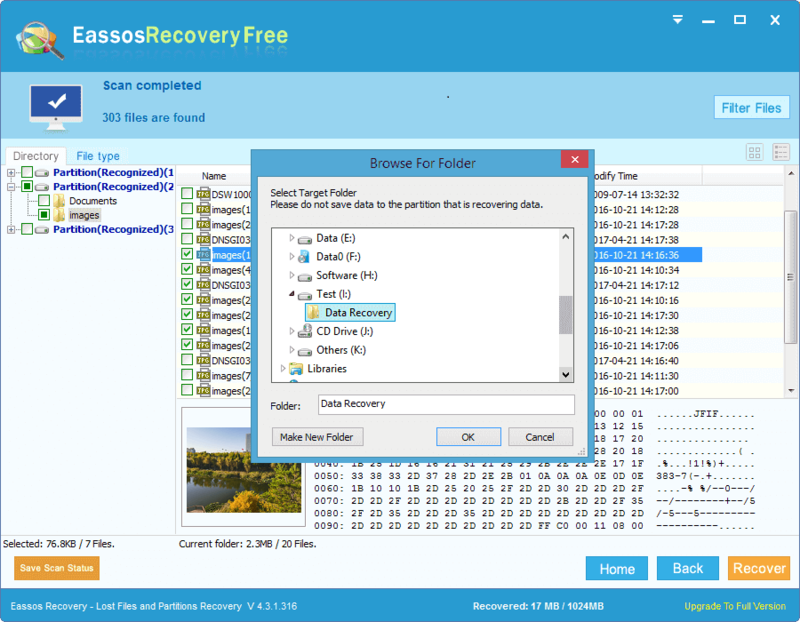 Step 1 Install and launch free file recovery software – Eassos Recovery Free. When download and install the software, do NOT save the installer or install it to the location which is suffering from data loss issue. Step 2 Select recovery mode. From the interface of the recovery wizard, you can see four recovery modes. To recover deleted files, the "Recover Deleted Files" mode should be selected. Step 3 Scan your drive. Select the drive where deleted files were stored before they were put into the Recycle Bin, and click Next button. 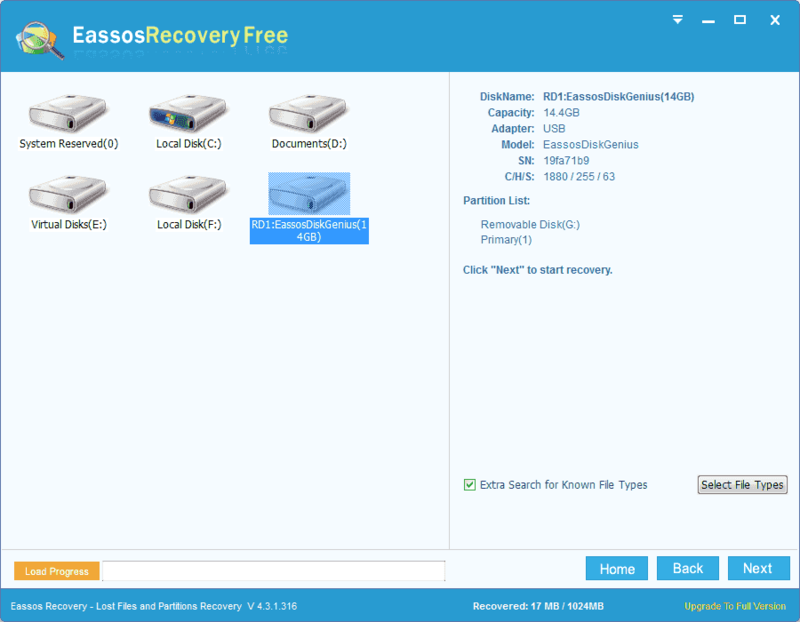 The Eassos recovery Free starts scanning the selected drive quickly and completely. Step 4 Recover deleted files. After scanning is over, you can view all recoverable files which are classified under Directory and File types tabs. You can choose files you want to restore and click Recover button to restore them to a secure location. 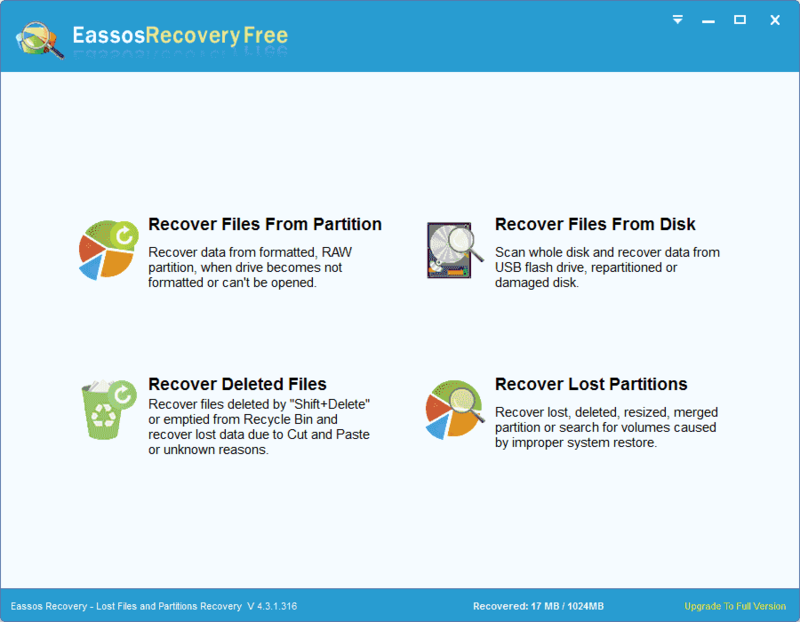 Eassos PartitionGuru is a versatile tool which is able to manage partition, recover lost data, backup Windows, clone disk and repair bad sectors, etc. When recover deleted files from SD card, empty Recycle Bin, USB drive or virtual disk, it is professional and easy to use. The Pro version is paid software, but its trial version allows users to search for deleted files and preview recoverable data. Thus users can test its recovery ability before purchasing it. This guide shows how to recover files deleted from Recycle Bin or via Shift + Delete in Windows 10/8/7/Vista/XP. Step 1 Install and launch Eassos PartitionGuru Pro from your computer. Note: Do NOT install the software to the partition where you want to recover data. Step 2 Select the partition which contained deleted files and click File Recovery button from toolbar. Step 3 Select "Recover Deleted Files" option under Recovery Options and click Start button. Tip: It is recommended to select "Search for Known File Types" option and set file types you want to recover especially when data overwrite has been caused. This option will perform deep scanning on hard drive so that it can find out as many files as possible. Step 4 Preview files to check file quality and find out what you want to restore. No matter whether the scanning process is done, you can view listed files and preview file content by double-clicking it. The following picture shows the previewing of a jpg file. Step 5 Choose files you want to recover from scanning result, right-click mouse and select "Copy To" from context menu. Then you should choose a different location to save recovered data. Since Windows does not completely erase data when it deletes files or empties Recycle Bin. However, file recovery is not always possible, for example, files that are overwritten cannot never be recovered by any means. Therefore, you should try to protect lost data from being damaged when you realize data loss problem. Keep calm and note down all actions you've done to the hard drive. Stop using the drive where lost files were stored. Do not access the partition or write data to it, otherwise, lost files might be overwritten. Check for backups for lost data. If you have created a backup for lost data, you can have a check if they can be restored from backup. Use clean & professional recovery software. If you do now have a backup, a data recovery program is needed to get back lost data. Download software from official website and do not try any cracked applications. Recovering deleted files from Recycle Bin is possible in a couple of methods and you can choose any solution depending on your actual data loss issue. If you do not have a backup for deleted files, you'll need to use data recovery software to retrieve lost data. To guarantee lost files can be recovered correctly, you should make sure lost files are not overwritten. Besides, if free recovery software cannot give satisfied recovery result, you can try professional software. If you have any questions on restoring deleted data, please feel free to contact our support team.